The future. In response to global warming, the “Ecological Community” has banned science and technology, returning to an austere agricultural life and nature-worship. One young farmer, Fizz, is tormented by her burning curiosity to explore the universe. 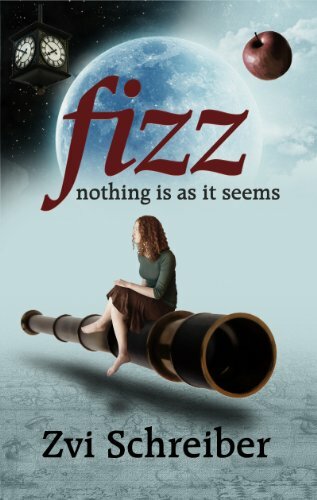 Leveraging a controversial legal loophole and her “Outsider” father’s invention, Fizz travels back in time and engages in conversations with Galileo, Newton, Edison, and Einstein. Unraveling the mysteries of the universe, she relives the contradictory ways in which science and technology redefine the human experience. Returning as a changed person from her epic quest, Fizz faces the decision that will change her world forever. In the genre of the highly successful Sophie’s World, Fizz weaves the bizarre and inspiring history of physics into the touching, dramatic, personal story of a young woman named Fizz who comes of age while voyaging across the centuries. This is a very smart idea, this edu-novel concept where you’re reading a fiction that takes you on a cruise through a subject, in our case physics. Physics for me is…how do I put this…there’s a reason why after studying it and chemistry well enough in high-school I went for sociology in college and didn’t become an engineer like both my parents. One of the reasons is I like physics when Michio Kaku is talking to me about it, for instance, on TV of course, or Stephen Hawking, or Morgan Freeman in the Through the Wormhole series. I’m gonna love to watch the episode, give it my full attention, keep the info I find interesting. Learning it, per se, as science? Never been a fan of the drier part of it – theory. I was always a fan of the experiments, but they were few and in between. After the first chapter of this novel, when the Collective makes an appearance, I wasn’t much into it but I stuck it out for a few more chapters. It didn’t work out; I mean, this Collective to begin with freaks me out. So we have these people, that have this very solid and set in stone view of things (and it doesn’t matter to me what they’re basing it on), that are striving for this communitary ecological way of life, but have a very closed off attitude toward this apparently evil Outside that is more techy-oriented and less naturey-oriented. My honest thoughts on this concept? Great, another group of extremist/close-minded people that are on a mission, marvelous. It’s a sort of attitude that makes me think not much of someone, that sort of “I know the Truth, I know the Way – and mine is the only way!”, yada yada yada. Not a fan of that, at all. And then comes the science, in a quite scientific tone, for me that not being much of a good thing, since I’m not a fan of that. So I capitulated, I tried it, it didn’t work out, I didn’t connect with the characters, the world, nothing, no chemistry there so to speak. If you guys wanna experiment with it, I say give it a try, the concept is interesting and smart.